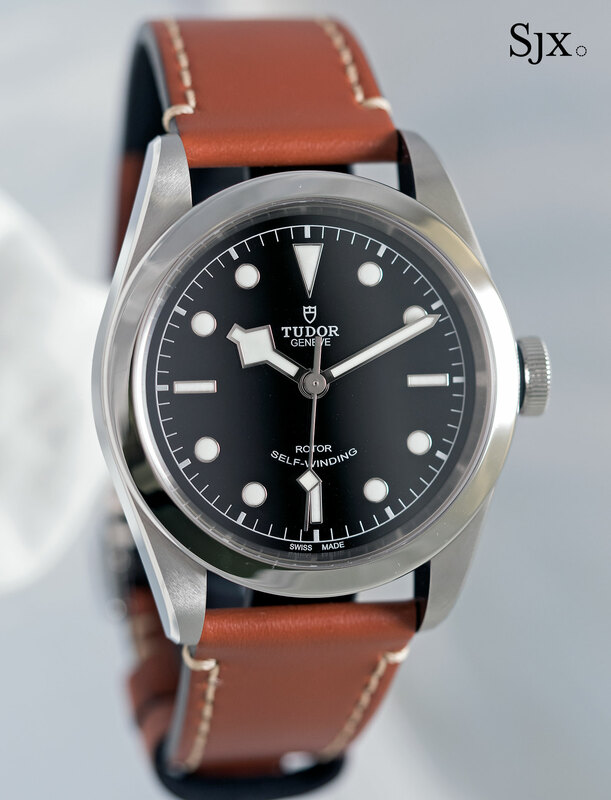 Last year Tudor took the covers off its most affordable Black Bay variant, a compact 36mm model without an elapsed time diving bezel. 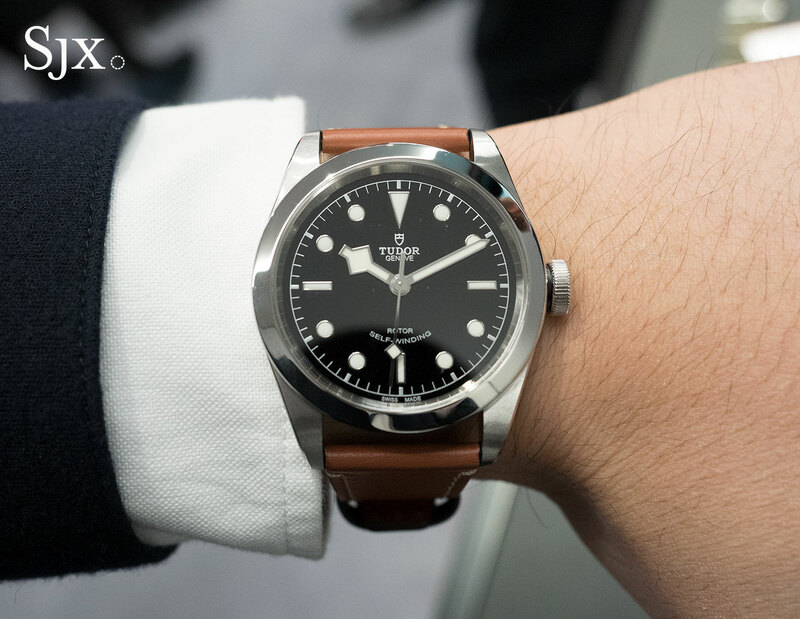 Now that’s been enlarged, proportionately it has to be said, and turned into the Black Bay 41 that’s just as affordably priced. The case is now 41mm in diameter, making it the same size as the Black Bay and even the new Black Bay Chrono. 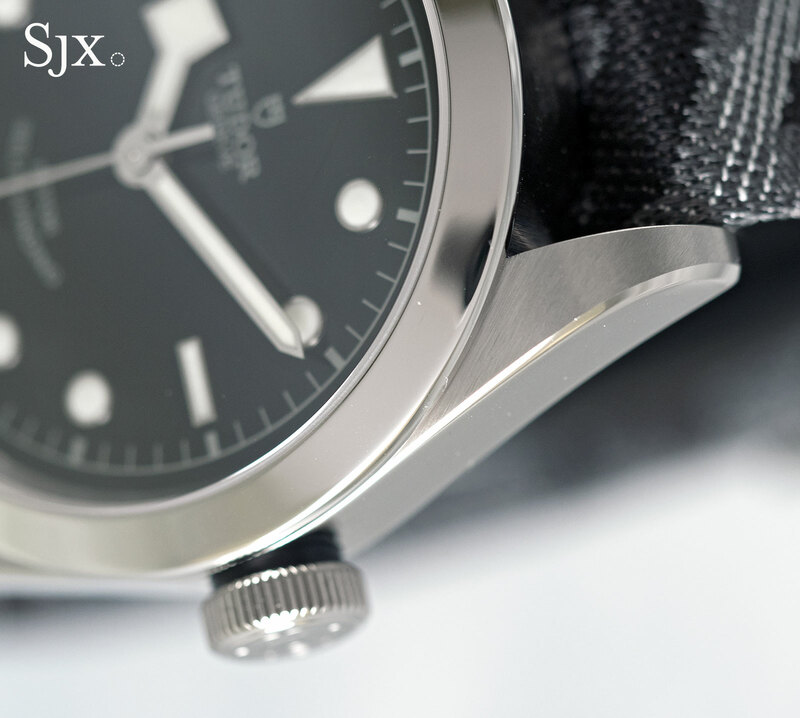 The 5mm extra it has over the Black Bay 36 is significant, giving it significantly greater presence on the wrist. 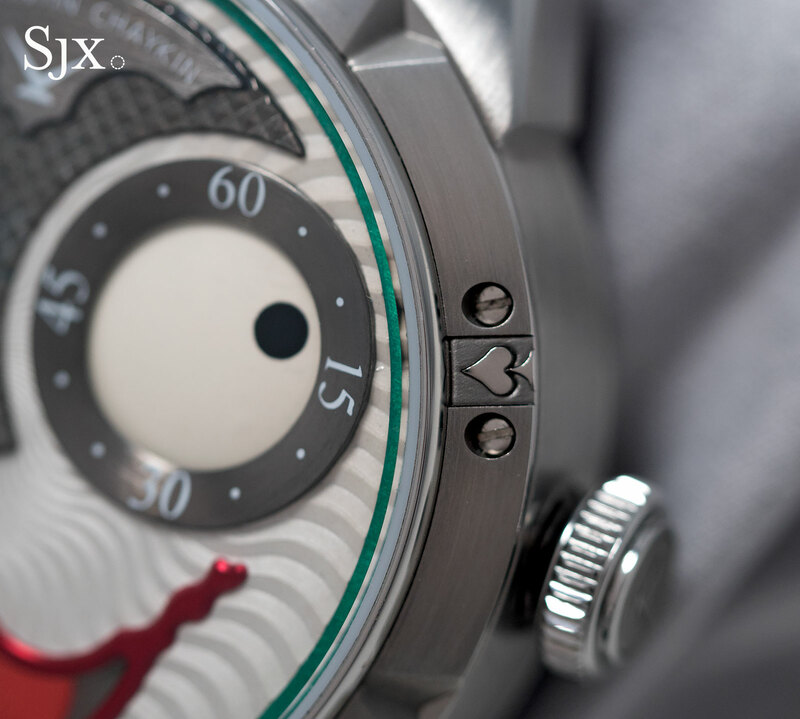 Its size is magnified by the plain dial and smooth bezel. Despite the current fad for smallish vintage watches, 36mm is too small for most men, though it worked well as a ladies’ watch with a military bent. 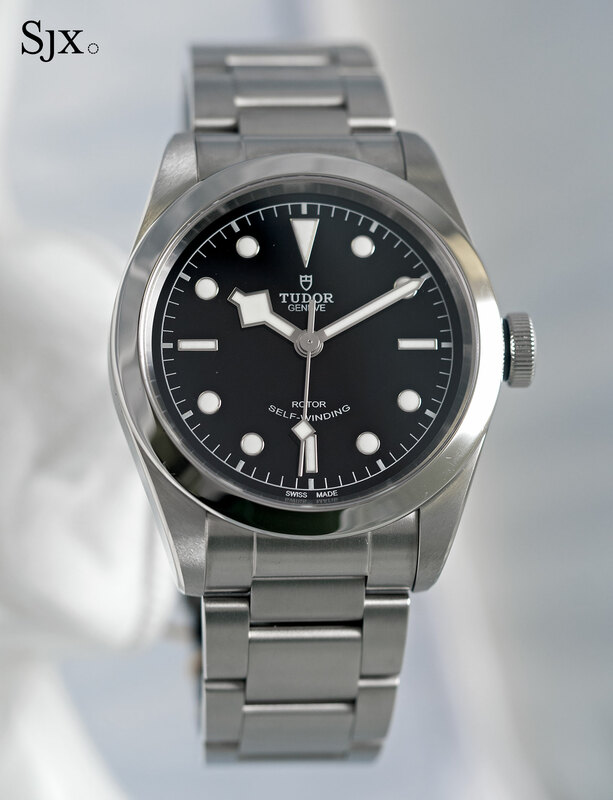 So the Black Bay 41 is a strong proposition, especially since it’s been upsized correctly. 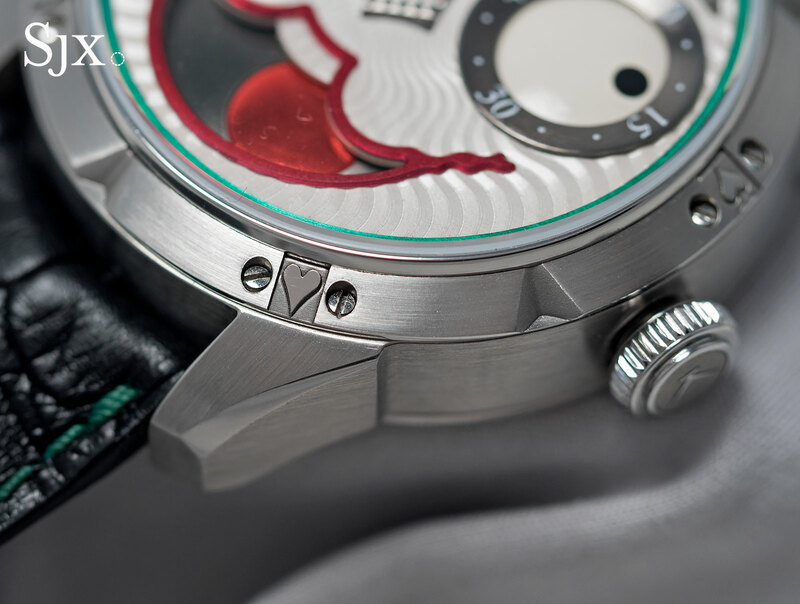 The dial and hands similarly resized to suit the new case. The snowflake hour hand, for instance, is longer, with a larger snowflake at its end. 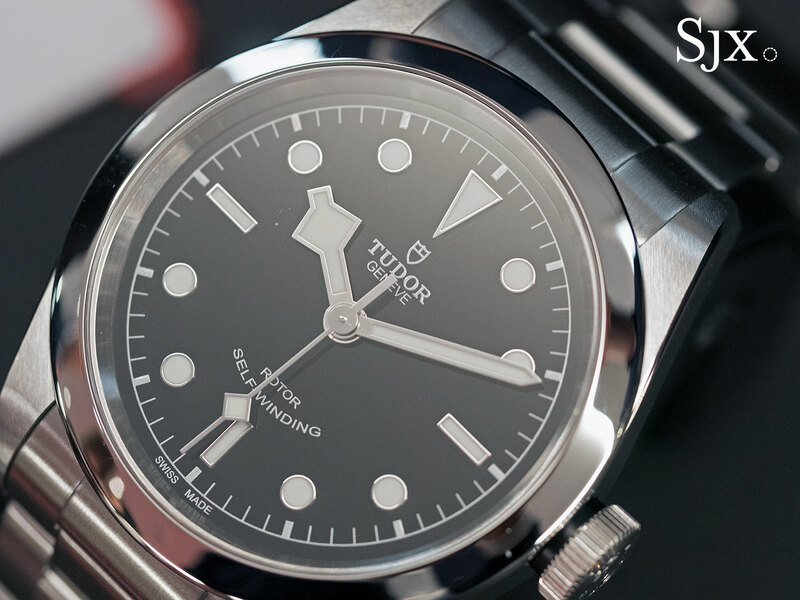 All the key characteristics of the smaller model remain: glossy black dial with silver print, flat bezel, and the Oyster-esque case with polished bevels along the edges. The case is rated to 150m, with a screw-down case and back. 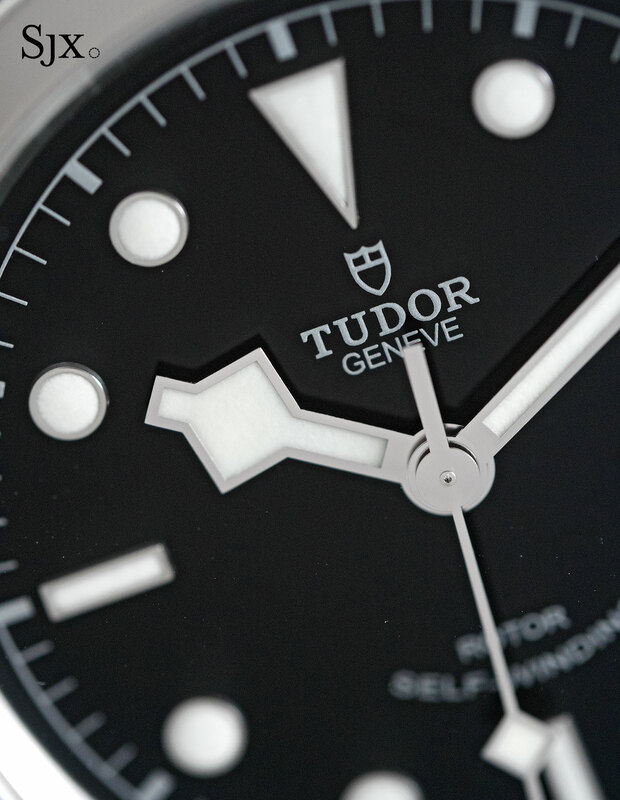 Inside is the still the ETA 2824, the movement found in Tudor’s entry-level models. Robust and economical, it’ll run reliably for a long, long time, but has the downside of a shortish 38-hour power reserve. 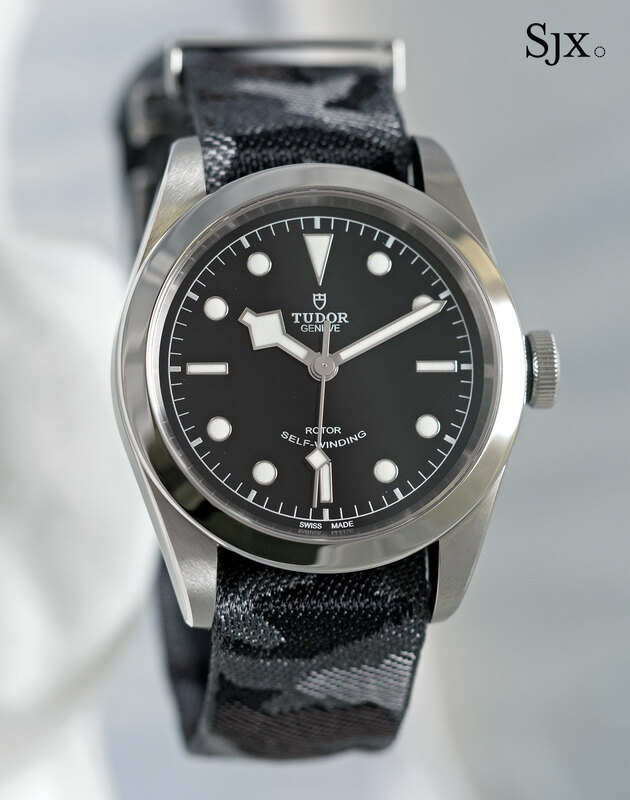 Like all of Tudor’s other retro style Heritage models, the Black Bay 41 is sold with either a steel bracelet or leather strap, both of which are accompanied by a spare fabric NATO-style strap woven with a grey camouflage pattern. 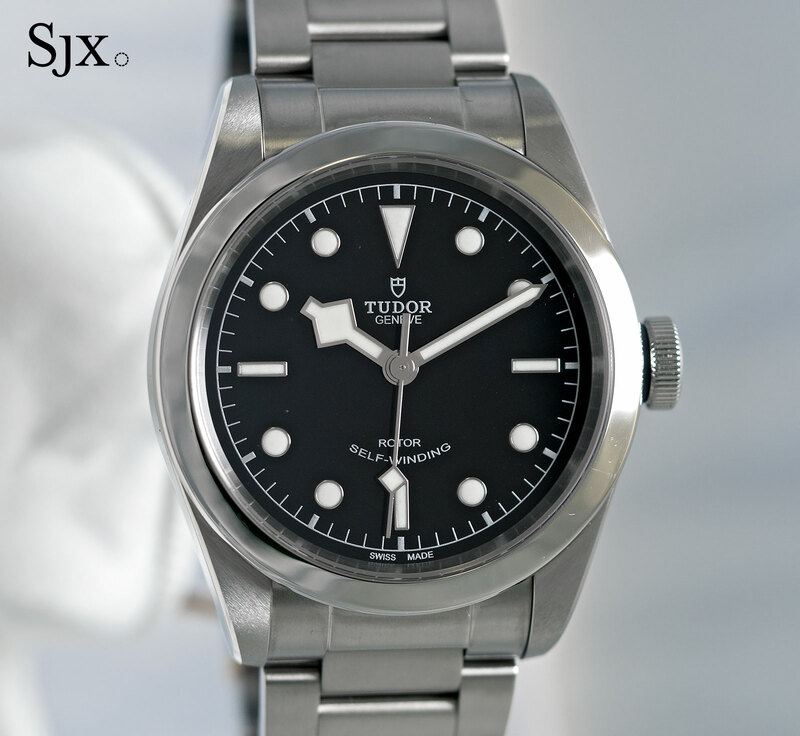 The steel bracelet is an Oyster-style affair, which is standard for Heritage watches with ETA movements; models powered by in-house movements get the riveted link bracelet as found on the second generation Black Bay. 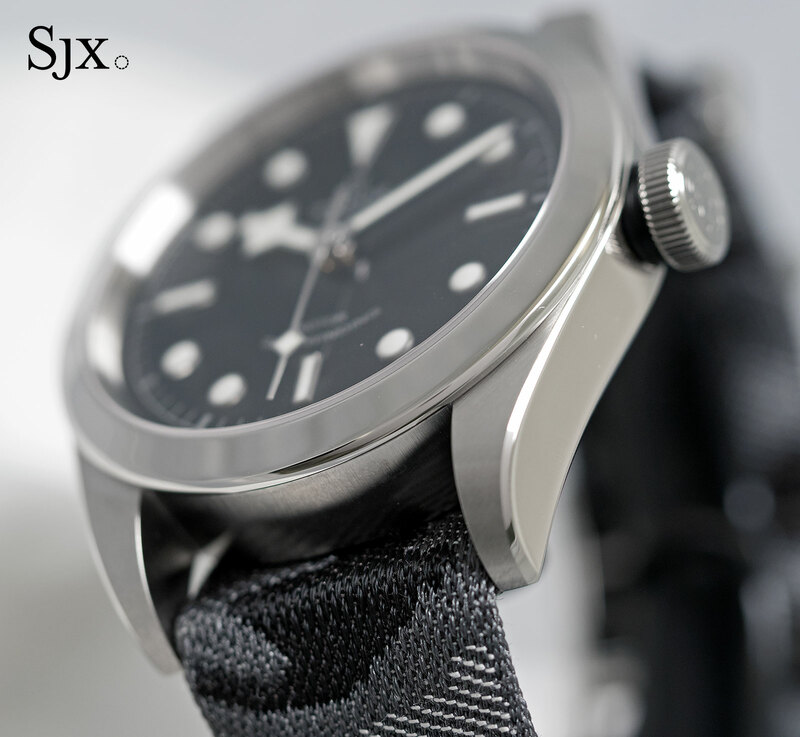 The Black Bay 41 will be available starting April 2017, priced at just SFr100 over the 36mm model. That means it’ll cost SFr2500 (about US$2600) on a leather strap and SFr2800 (about US$2900) on a steel bracelet. Addition March 25, 2017: Type of steel bracelet added. Addition March 27, 2017: Photos updated. 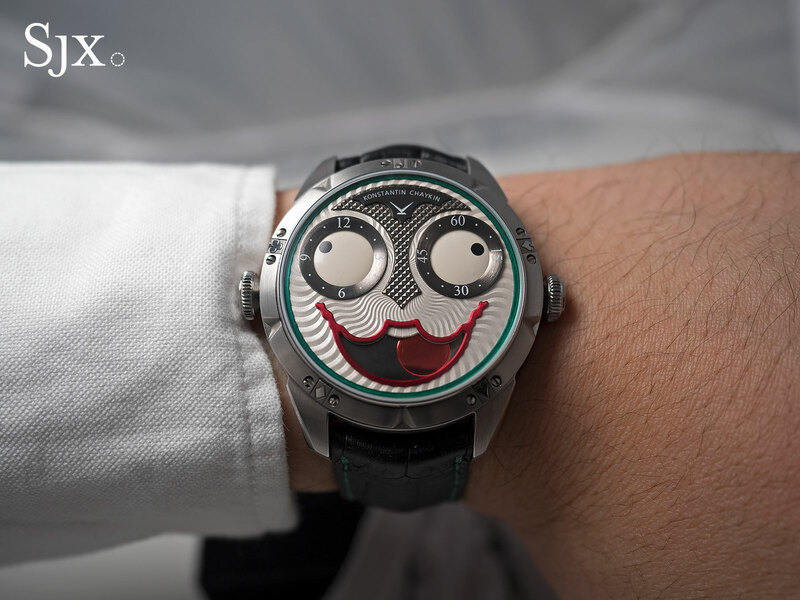 Unveiled just before Baselworld 2017 with some hilarity, the Konstantin Chaykin Joker is one of the highlights of the event. 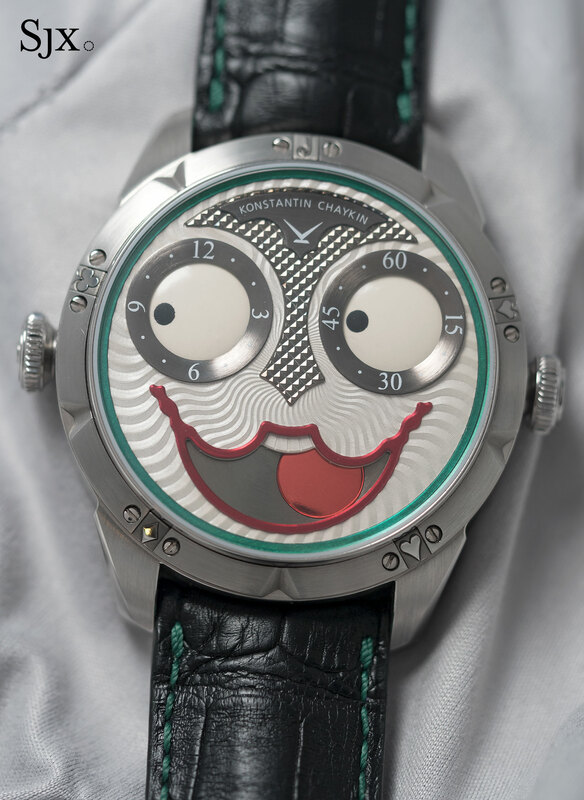 Chaykin is a member of the AHCI, so while the Joker is delightfully silly, it is a proper mechanical watch. A simple but ingenious rejigging of the time display creates the face, which shows time and the age of the moon. 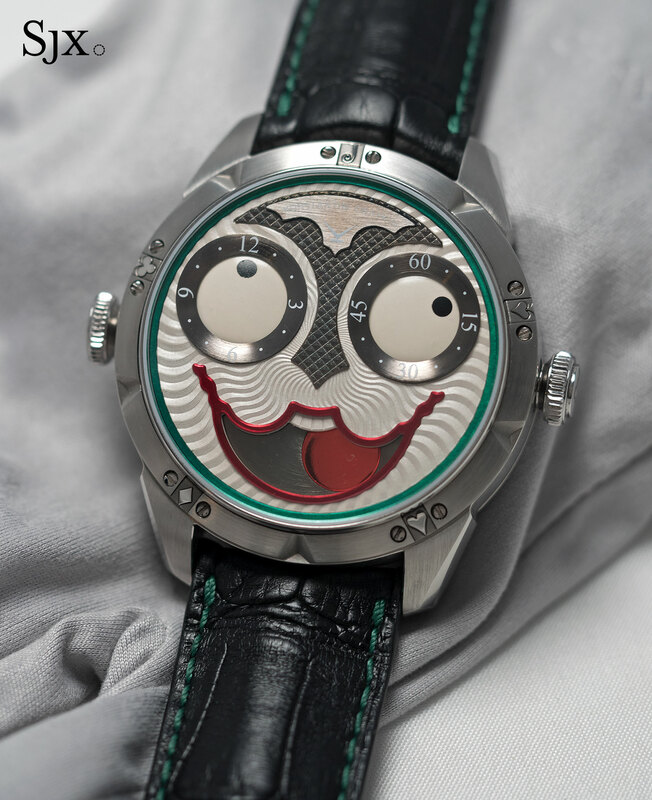 The Joker tells the time regulator-style, with the hours and minutes indicated on separate dials that form the eyes of the face. Hours are on the left and minutes on the right, with the pupils of each eye indicating the time. Because the pupils travel at varying speeds, they often end up in opposite directions. Consequently the expression on the face varies throughout the day, but is continuously amusing. Telling the time has never been so mirthful. 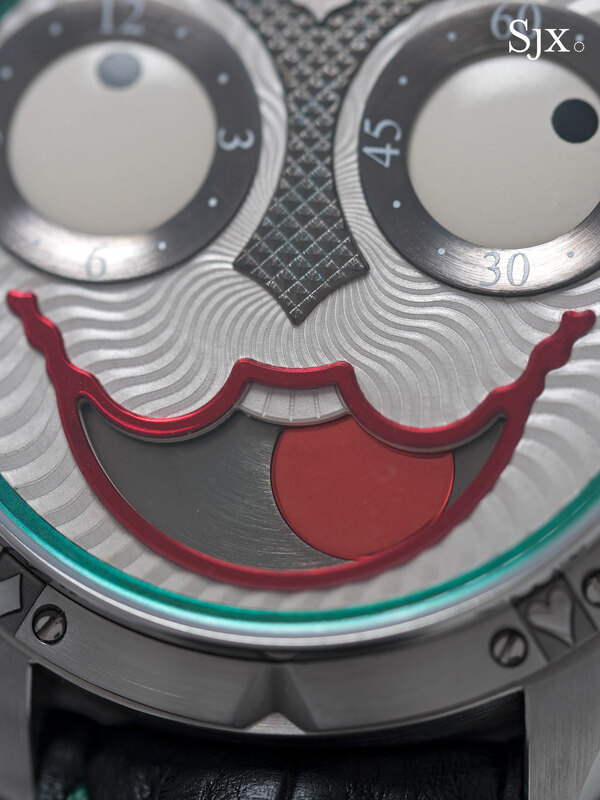 A moon phase display compounds the humour of the dial, taking the form of an open, smiling mouth. While the time is set conventionally via the crown at three, the moon phase can be advanced with a recessed pusher set into the fixed crown at nine o’clock. 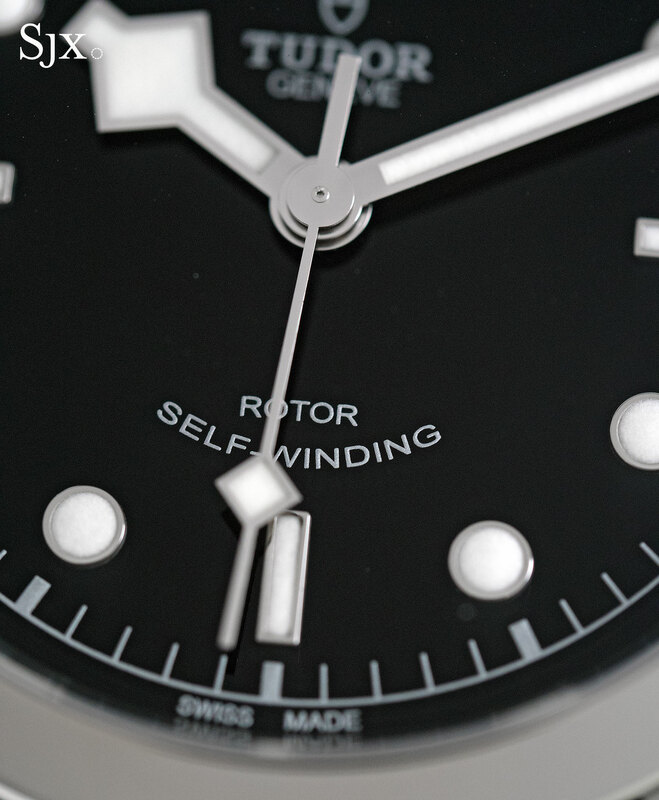 The dial is decorated in a fairly traditional manner, with a wavy, radial guilloche on the silver-plated surface. 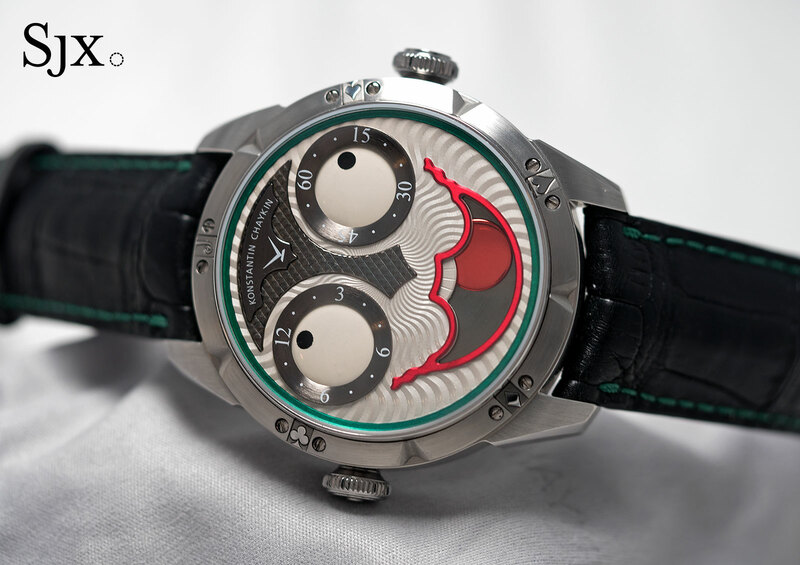 The nose of the face, on the other hand, has a hobnail guilloche and ruthenium plating, giving it a dark grey finish. 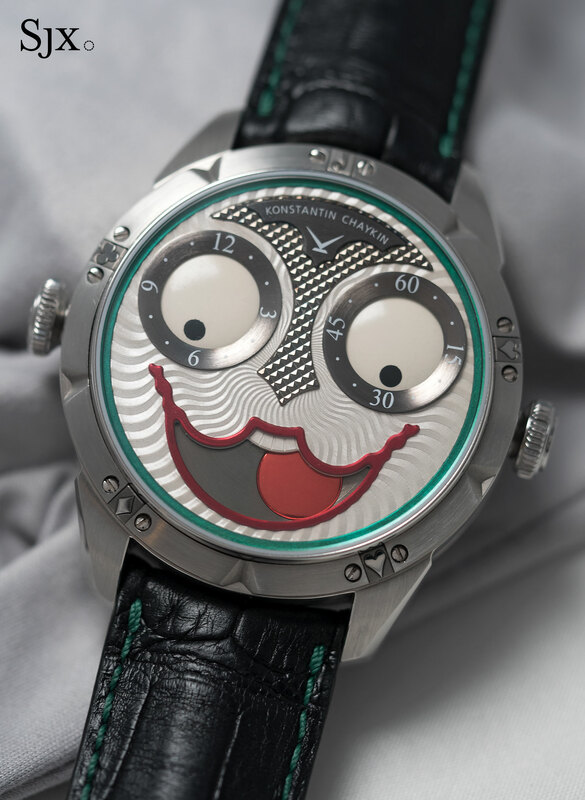 Despite the lighthearted nature of the Joker, its origins lie with a more serious timepiece. 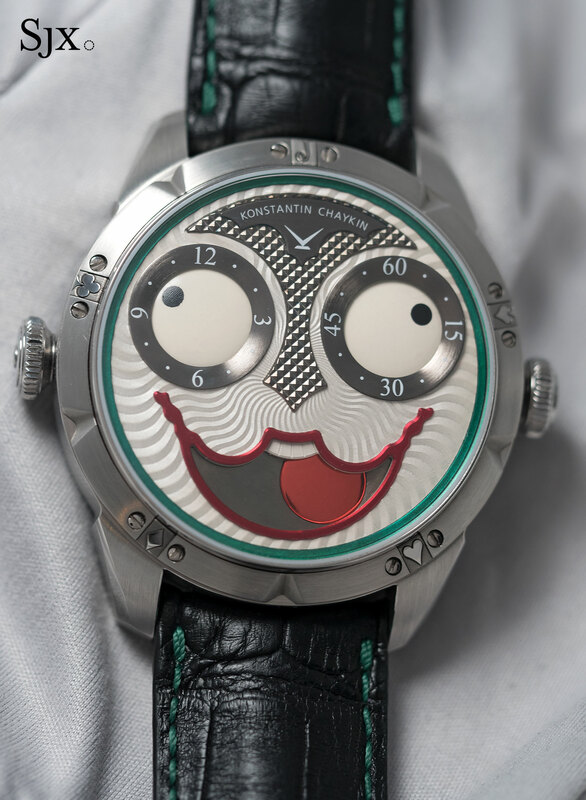 The Joker evolved out of Chaykin’s Decalogue, the only wristwatch that shows Jewish time, which also has a moon phase at six o’clock. Chaykin realised that the time display on the Decalogue could be tweaked into a face, resulting in the Joker. The movement inside the Joker is built on the ETA 2824, making this the first watch in Chaykin’s line-up that uses a Swiss movement. 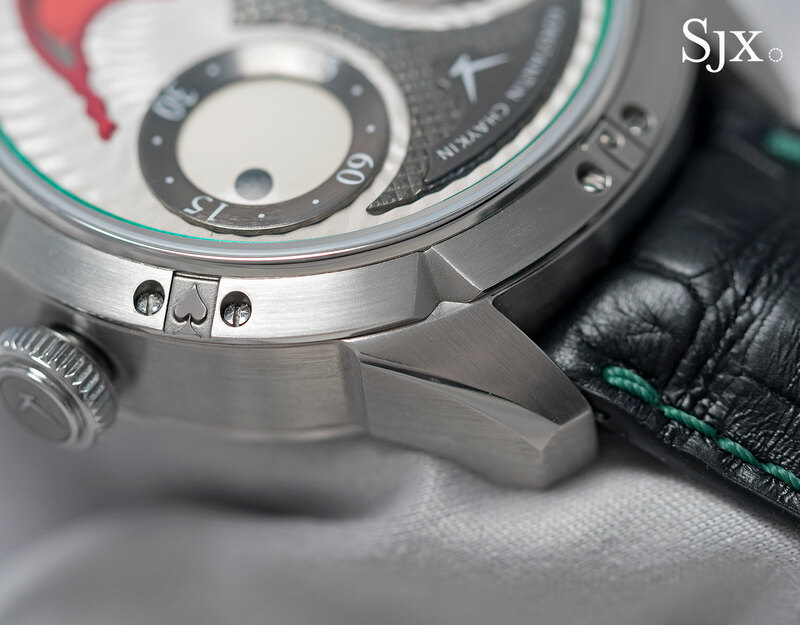 While the ETA 2824 is impossibly robust, it does have a short 38-hour power reserve. On top of the ETA sits a 61-part module that shows the time regulator-style as well as the moon phase – this module is produced in-house by Chaykin. All of that, however, is hidden behind the solid back, which has been cast with a “J” in the centre. 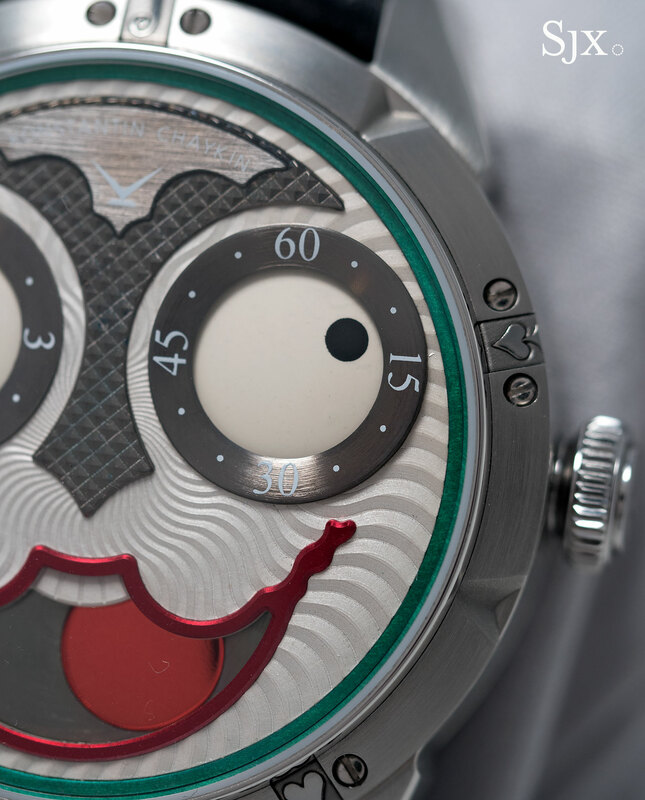 The letter’s curly tail is reminiscent of the script found in several Time Burton movies, including The Nightmare Before Christmas and Alice in Wonderland – a visual style that’s a thorough match for the watch. Chaykin makes his own watch cases, including the steel case of the Joker. It measures 42mm in diameter and 13.7mm high, giving the watch good proportions. 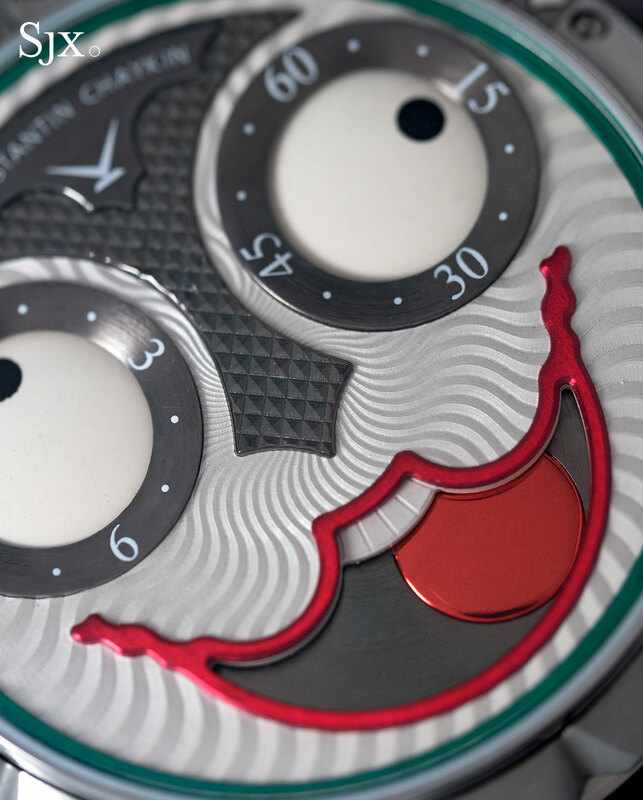 The wide, sloping bezel makes the Joker seem smaller than it is. The case is steel, well detailed, and neatly finished. Up close the edge finishing of the case is slightly uneven, but that suits the look of the watch just fine. 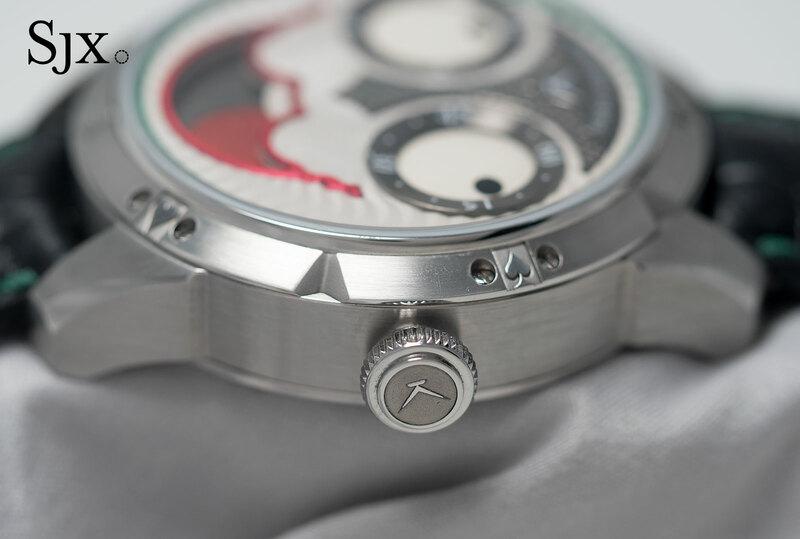 The irregularity in some of the finer details of finishing is a consequence of the watch is manufactured mostly in-house. It’s worth noting that practically all of Chaykin’s watches and clocks are all powered by movements that are in-house and 100% Russian. The bits he cannot produce, like jewels and springs, are purchased from Russian suppliers. 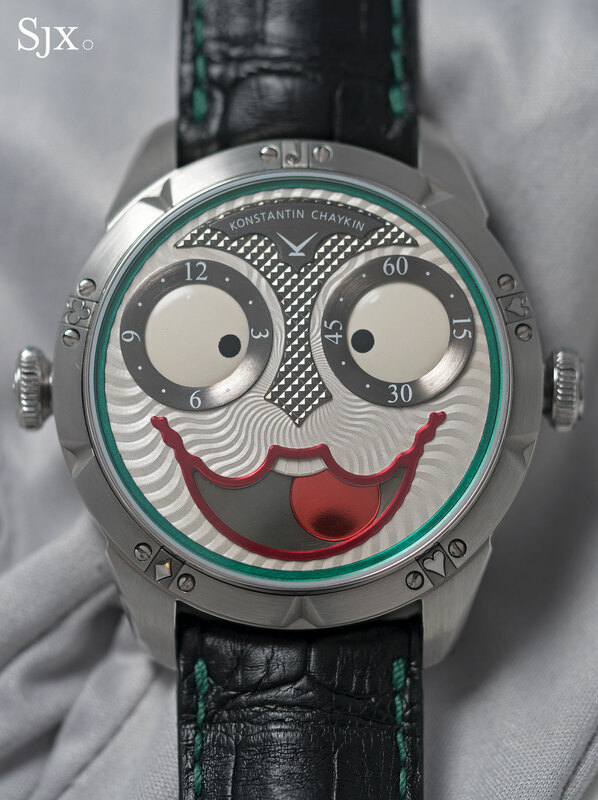 The Joker is a limited edition of 99 pieces in steel, priced at €6990 before taxes. That’s equivalent to US$7550. For the money the Joker is a compelling buy. 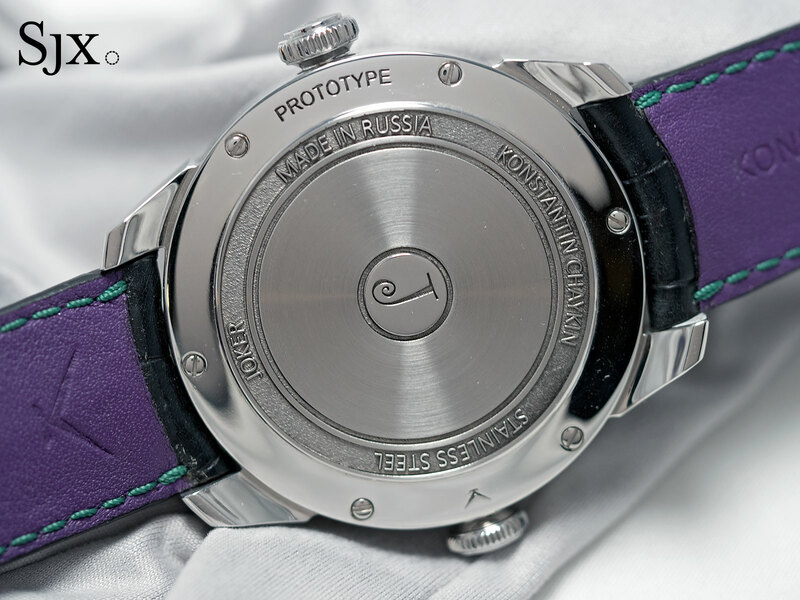 It’s available from Konstantin Chaykin.